Picnic At Marina: Why My Saturday Was Wordless? I lingered in the bed for a while, then had some tea while reading through my e-mails. Day promised to be slow... until... until I realized that I need to: make some bread, make some dessert, make some pasta, fold the laundry, water garden... You've got the picture, right? And before all that I had one stop to make: every day I start with a workout at the gym: run and either yoga, or aqua fitness, or cross training. To exercise first thing in the morning is a must for me, you know I have priorities, right? 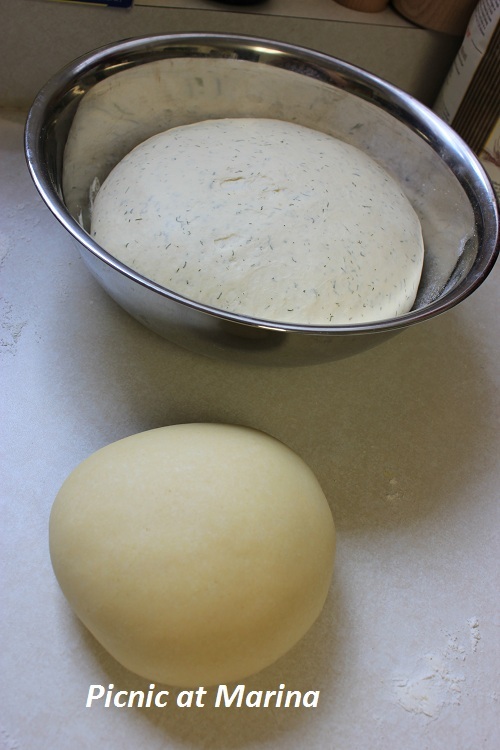 Then I thought, that I should make the yeast dough for the bread and pasta dough before I leave the house, so by the time I am back it is all ready to roll. Five miles later (a little over 8 km) I got back to my kitchen. Both, pasta and bread dough, were perfect and ready to be played with. Bread dough had another good kneading and placed in a pan to rise one more time before baking. Pasta dough needed some filing as my dear teenager challenged me (more on that in one of the next posts) to make a regional Italian dish, and he also picked the region. One of the ingredients for vegetarian filling were mushrooms, and the other filling was meat. Both fillings were made from scratch, including grinding meat as I don't really believe the store bought one after reading numerous articles on what's in it. Skipping the boring technical part, by the time we were ready to roll the pasta dough (which teenager does with our pasta roller attachment with endless giggles and jokes, entertaining me as well) it was dark outside. Our Saturday dinner was late but good and worth all the work we've done. When I finished all my planned, and a few unplanned chores for the day, it was close to midnight. My charged by five miles run energy was just enough to post a photo of that cute little face and drop asleep. All I can say is, wonder woman! That tortellini looks great. 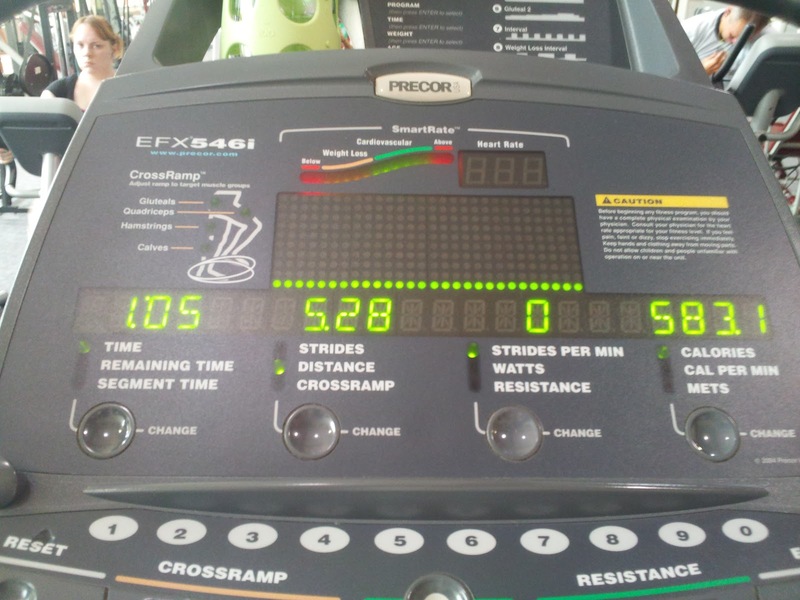 8km is a long way on the elliptical. I go to the gym about 3 times a week but tend to do a little bit of this and a little bit of that. Having said that I don't imagine it would all add up to 8km - great work! I'll see what I can do tomorrow. Oh my God - I'm not kidding, that lump of pasta dough actually looks like the smoothest, most perfect thing I ever did see, and the tortellini sound, and look, delicious. Great job! 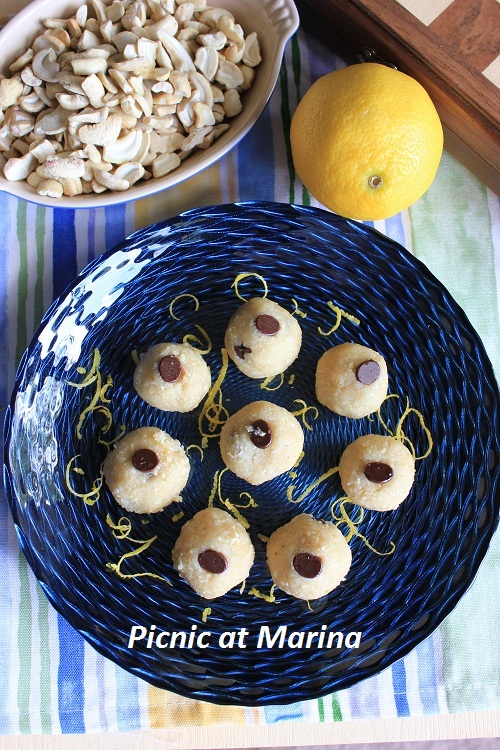 Care to share your insanely impressive looking pasta dough recipe? Maybe you did before and I missed it? Sounds like your Saturday was perfect without words. Dear Marina, Your day was blessed and beautiful. It really is good that you have your plans and stick to them. It is wonderful that your son helps you with the pasta. He will have good memories. I don't like to buy store bought chopped meat either. Your meal looks wonderful. It doesn't matter what time it is served it is served with love. I don't always eat on time either, as a matter of fact I usually never eat on time!! So busy... which of course is awesome since you made some delicious looking meals. Love the Tortellini. WOW! do you take reservations? I would love to try this pasta...oh and the bread...and anything else you make! Enjoy your week! Stay cool! I totally understand the business! The meal looks amazing! It's incredible how exercise can change your day, right? This was a full day indeed Marina! And you managed to excel to all of them! I can't believe you just ran 5 miles and still have the energy to roll our pasta! You are super woman! I can barely do anything after I run a mile! 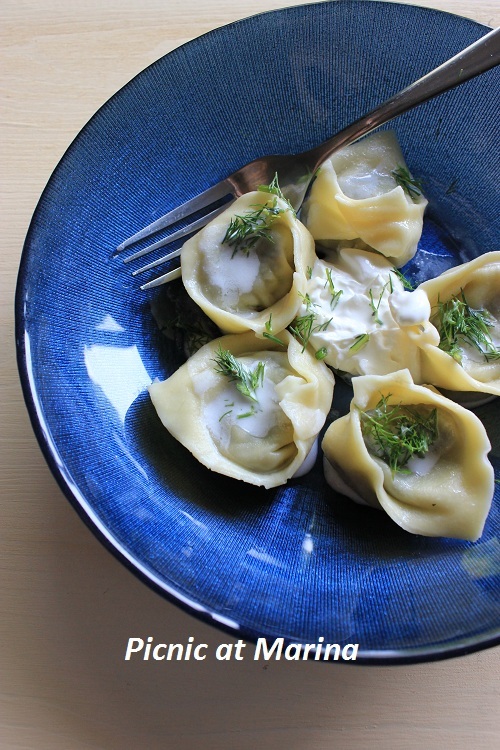 Your tortellini looks absolutely gorgeous, though! Marina, after running 5 miles...and making homemade tortellini; wow! shame on me! and to think I cooked a huge pot of chicken soup, w/fresh noodles, and rush off to Miami airport (65 mi. one way) to pick up family returning from Italy, was not too bad. 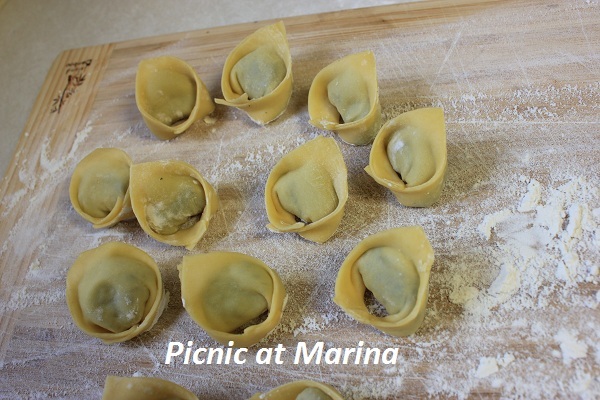 Love your homemade tortellini...will try it myself. Filling is awesome! Very productive day. I can sleep until three in the afternoon-)) My day are slow now, kids are in Russia with granny. Your tortellini looks very professional, good job! Wow, I'm exhausted just reading about your day! Actually if we don't get out fitness fix we get cranky. We walk at least an hour a day, and have a treadmill and exercise bike for days we can't walk outside (even then, I'm usually on the bike or another 40 to 60 minutes). Anyway, you made some great stuff - love the top photo! Thanks. Love all the homemade goodies. I need to start making my own bread and pasta! Yours looks gorgeous. It sounds like you had a great Saturday! I'm glad you have fun with 'the teenager' too, I like how he challenged you to make regional pasta! I think you rose to the challenge - looks great. Seriously Marina I am a yogi myself and a yoga teacher and I have never thought about walking, always driving so I think it's perfectly ok to drive to your club :-) No worries or doubts whatsoever. You do your hard job at the club that's more than enough ;-) hihihihi. I can see that you mastered organization skills into perfection with all this planning and thinking in advance what can be done when to save time. Bravo Marina!!! The tortellini look amazing! i have to say you excel in time-management. impressive!!! !